Provides the perfect setting for your business and personal needs. Our extensive range of services and facilities are available at your disposal to ensure you'll have an extraordinary stay. Be right in the middle of the action as our strategic location puts you right where you should be - front and center. And finally, our highly-trained staff will make you feel at home from the minute you step right in through our doors until the moment of your departure. The Hotel and Residence offer 151 rooms with a choice of studios, one -, two- or up to three bedroom apartments, each of which is beautifully decorated, modern and features a range of home comforts overlooking the Creek. Ideal for long-staying guests or families requiring extra space, these apartments feature living-dining areas as well as well-equipped kitchens. Meeting and Conference facilities will be available soon for 200 people. Located in the heart of Deira, Dubai's bustling business district, the Clover Creek Hotel Apartments Deira occupies a fantastic position close to the famous Dubai Creek and just minute from Dubai International Airport. Clover Creek Hotel Apartments Deira Dubai is within walking distance of Dubai's famous Gold and Spice Souks. 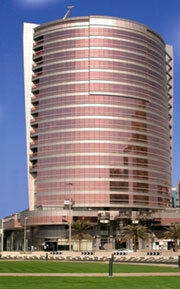 A number of the city's top shopping malls including BurJuman and Deira City Centre Mall are a short drive away.